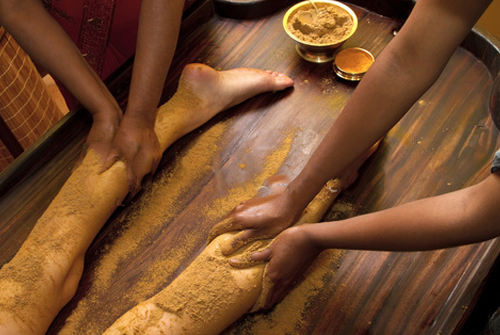 Abhyanga is the traditional ayurvedic massage. 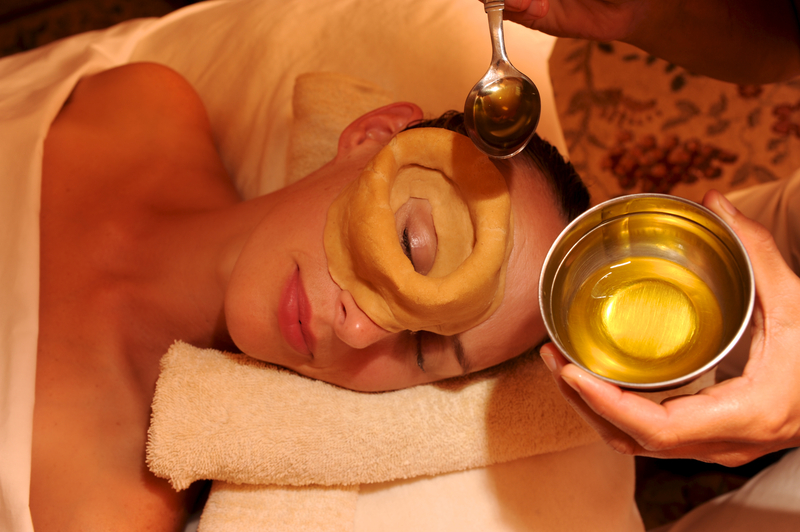 Medicinal ayurvedic oil are generally chosen according to one’s dosha for performing abhyanga oil massage. By all means, It’s a therapeutic massage, not a relaxation tool. Abhyanga most importantly aims to encourage the movement of toxins from the deeper tissues into the gastrointestinal tract and eliminate them efficiently. It is also given to stimulate circulation of the blood and lymph. • Elimination of impurities and toxins from the body. Abhyanga is nourishing, pacifies the doshas, relieves fatigue, provides stamina, pleasure and perfect sleep. Moreover, it also, enhances the complexion , enhances the skin lustre, promotes longevity and nourishes all parts of the body. Marma massage is the pressure point massage. In India pressure points are called marmas. According to Ayurveda, 107 marmas exists in the whole body. Ayurveda states that every marma point places at a junction of different channels of prana movements in the body. Prana is the subtle vital energy that pervades every part of the body, nurturing the cell systems. If there is a block in marma points, it interrupts prana flow and causes diseases in organs. If they are clear, prana is free to travel and the body is healthy. 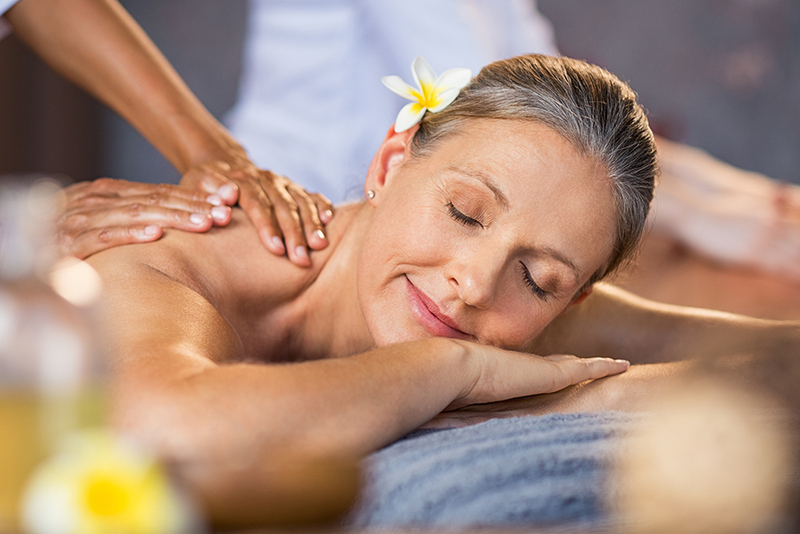 Marma massage is therapeutic, relaxing and revitalizing. 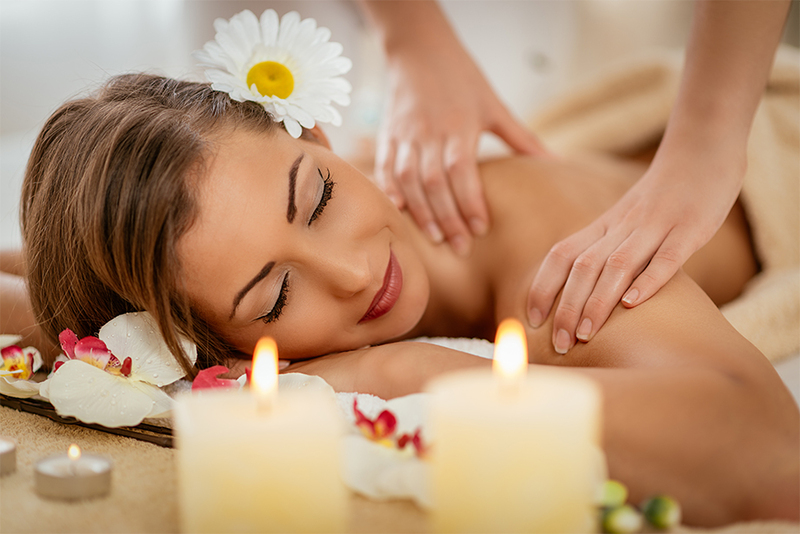 Benefits of marma massage are a general balancing- body and mind, emotional, spiritual and physical. Thereby, resulting in clarity, calmness and confidence. 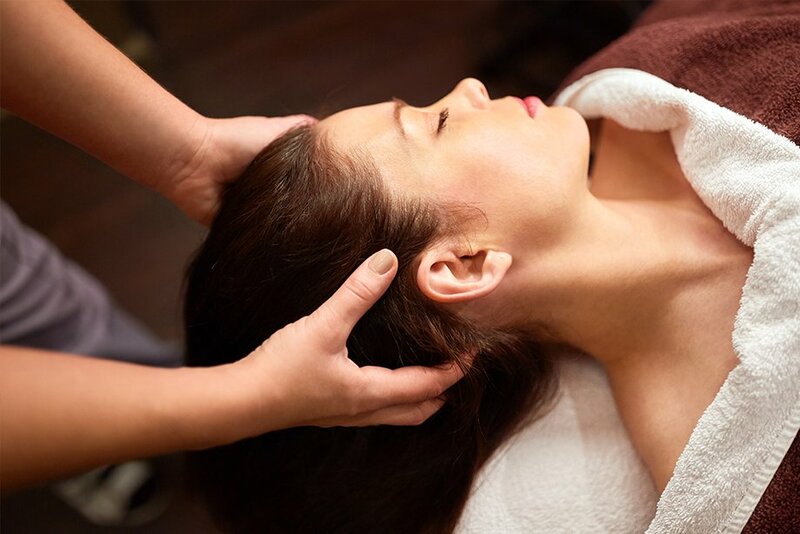 Indian head massage involves work not only on the head but on the upper back, shoulders, neck, scalp and face too. Head massage does not only affect the immediate areas of massage, but also a healing , rejuvenating and thoroughly stimulating experience. Releasing the mental and emotional stress immediately. In additional, the head massage improves the supply of glucose and blood to the brain, dissipates the toxins and opens the channels. Results include improvement in memory, clarity of mind, better eyesight and concentration and clearing of the sinuses. The head massage nourishes and strengthens all the body openings especially the nose, eyes, ears, mouth and the top of the head. During a head massage, certain vital points(marmas) on the head get a pressure treatment, resulting in enhancement of immunity, treatment of the pituitary and pineal glands, a strong nervous system and improve alertness of the body. It keeps vata, pitta and kapha in balance. A stimulating massage using dry powders and not oil. The therapist rub dry herbal powders, chosen according to one’s dosha, into the skin in the opposite direction to hair growth with strong repeating movements. The friction of the powder during massage creates body heat that increases circulation, breaks down cellulite, firms muscle tone and reduces fat by improving the metabolism of the muscles. Dry powder massage helps in weight loss, as it reduces cholesterol levels and adipose tissue and promotes better digestion. It also removes toxins and exfoliates the skin leaving skin tingling, soothing and soft. Most ayurvedic massages tend to use long, flowing strokes that go away from the heart and from bottom to top, but Udwarthanam employs short, sharp superficial rubs that go in the opposite direction, away from the heart towards the extremities and from top of the body downwards. This is the opposite of the dosha flow. The powder helps to open up the micro channels in the body, so reduces fat accumulation, tautens up muscles, reduces bad body odour and exfoliates dead surface skin cells. Kati means waist or lower back area of the body and vasti means holding the medicinal preparation of oil on the site of ailment. So kativasti involves retention of the warm oil on the lower back or other parts of spine for a particular time period. Kati vasti treatment helps in strengthening the muscles especially those in the low back region. It helps in alleviating neuronal complaints, lumbago, and sciatica. This treatment is effective in muscular spasm and inflammations in the lower back region. 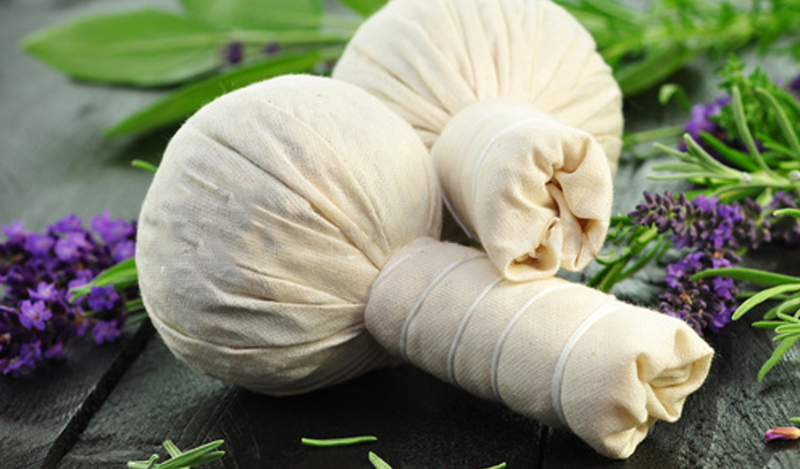 The hot herbal pouch or Kizhi (bundle) therapy, the herbal poultice is a time honoured tradition of healing with heat. With goodness, tie the warm pouches of herbs, plants, roots and apply to sore, sprain and sad bodies. Classification as a Swedana (Sanskrit for sweat therapy) in the Vedic texts, the herbal poultice is both detoxifying and healing. The Therapist tie the special selection of ingredients in natural cloth, steam for a few minutes. Then, dip in medicated herbal oil and apply to the body of the patient. On application, the heat induces sweating, thereby helping to bring toxins to the surface of skin; then, once the pores are open, skin absorbs the properties of the herbs for healing. It is a stand alone treatment or in conjunction with another therapy such as massage. The content, method of application and usage varies widely. Instill eye drops or apply as vasthi or enema into eyes. Patient lay down on the table. The therapist apply the paste two inches over and around the orbital area of the patient while eyes are closed. Pouring the suitable medicinal preparation of ghee or oil very slightly warm on the closed eyes. After some time patient should blink his eyes, several times, so that the medicine comes in contact with the cornea. On administration of proper Tharpana, tolerance to light, clear vision etc improves. It is good for the dryness of eyes as well.